It is cold and wintry over here… definitely piles of book weather… here are our latest and greatest reads from PanMacmillan South Africa. Two of these books make our list of the “Best of the Rest” for the year… that is going to have to be an extra special post nearer the end of the year!!! Picture Book Biography… Everything to Love!!! 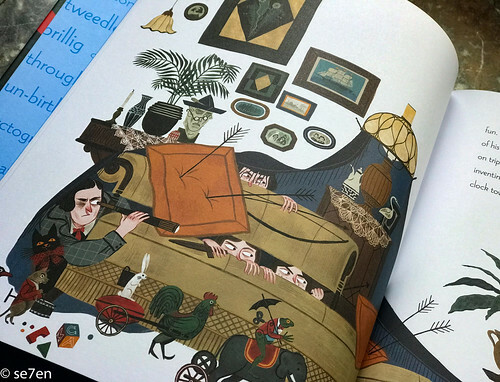 One Day in Wonderland: A Celebration of Lewis Carroll’s Alice: by Kathleen Krull and illustrated by Júlia Sardà: Gotta love a picture book biography and this one is truly beautiful… We love it, LOVE IT!!! We always read about Lewis Carroll in terms of his works, but this book is the story of the man behind his wacky classic stories and poems. We learnt that he had ten younger siblings, that he was full of fun and always looking for an excuse to have just a little more fun!!! His words are in red through out the book, for instance his stories sent his siblings into a Jabborwocky. In this book you will discover how the story of Alice came about and how the real Alice said, “Write it down!” She was ten and just as bossy as the Queen of Hearts. There is a list of some of the magnificent words that he invented as well as a biographical spread. This book has the most fantastic illustrations, it is a delight through and through… everything to love!!! You can meet the author Kathleen Krull, here and illustrator, Júlia Sardà, here. Alice’s Adventures in Wonderland and Through the Looking-Glass and What Alice Found Thereby Lewis Carroll and illustrated by John Tenniel: These books go together… and they are beautiful. We have reviewed Alice in Wonderland before… it is one of my children’s all time favourites and so has been read and reread in almost every kind of presentation. The thing about this Alice and these versions of the books is their lovely large format… you feel a little bit like Alice when you are reading them. The books are just lovely, beautiful red gilded edges, lovely large font… and perfect for a chapter a night at bedtime. There is a reason these books are classics, lovely quirky poetry pops up in the stories again and again… if you have never read Alice in Wonderland to your kids make a start on it… you may well find that you love it!!! Race to the Bottom of the Sea by Lindsay Eager: From the author of Hour of the Bees, which we absolutely loved… comes Race to the Bottom of the sea. Fidelia Quail is the eleven year old daughter of two marine research scientists. The book opens with the the two scientists at the bottom of the ocean in a rickety submarine created by their inventive daughter, who is on the surface trying to tag a new species of shark. As the day rushes to an end and the season threatens to change as the tide turns, so disaster strikes and Fidelia’s happy existence takes a dramatic turn for the worse. Things don’t improve and you find yourself off on an exciting romp. Our protagonist is delightful… this is the kind of kid you want to raise, she is feisty, funky and has an undeniable never-give-up attitude. She is captured by pirates… and things go from worse to even worse really fast, an unexpectedly delightful read. 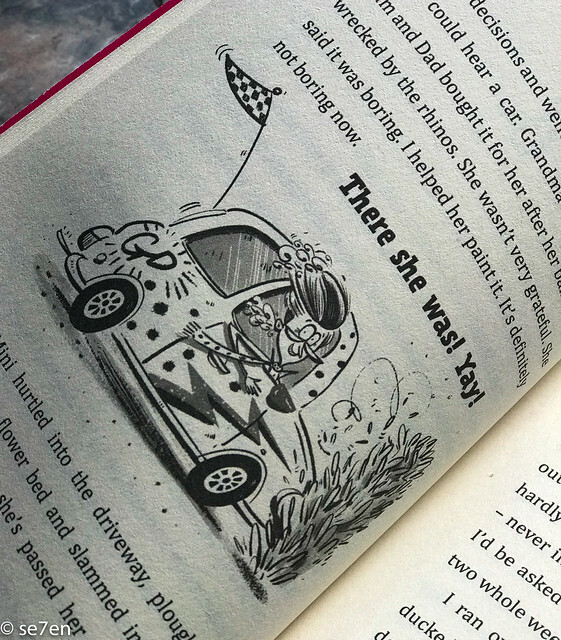 This is a childhood must read… this goes straight onto our family-read pile. You can meet Lindsay Eager here, and discover nine things you did not know about her. Homer’s Iliad and Odyssey: Two of the Greatest Stories Ever Told retold by Lillian Cross and illustrated by Neil Packer: Some of my children absolutely love stories of the ancient world and others do not… I was a little sneaky and didn’t tell them anything about this book… and just started reading… and got an instant: “Read on, read on…” At the end of each chapter. 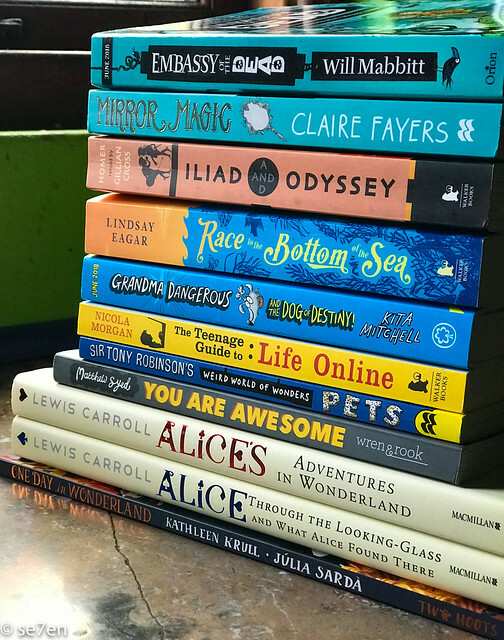 So on we read… I have to say that these are the first retellings that I have ever read to my kids that were so easily readable. The Iliad is the famous story of the Trojan horse… a long and indefatigable battle between the Greeks and the Trojans. It all began when a Trojan prince stole the King of Sparta’s beautiful wife… and then the gods got involved. 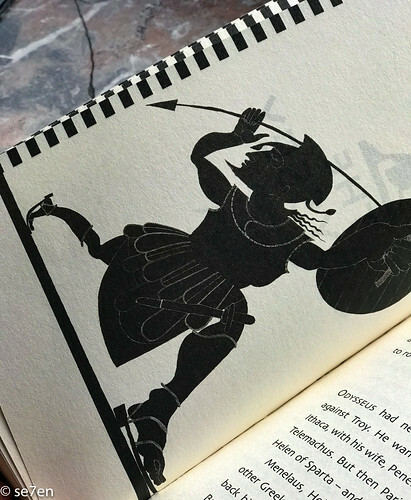 And the drama continues in The Odyssey, where Odysseus is trying to get home after the war, only to encounter endless challenges, struggles, not to mention monsters… really a book that was written in ancient times that captures the imaginations of folk to this day. If you are looking for a great way to introduce the classics to your kids… then this is a great place to start. Apart from that it is a beautiful book, I love the classic illustrations and how they decorated the spine… this is indeed a book that I want to keep on our shelves and has been taken down to reread again… so clearly it is a winner. You can read more from Gillian Cross at here website here, and the illustrator, Niel Packer over here. You Are Awesome – Really!!! You Are Awesome: Find Your Confidence and Dare to be Brilliant at (Almost) Anything by Matthew Syed: When a motivational speaker, climbs into a funky book for teens and tweens and their associated adults, and then tells them exactly how to be awesome. This book covers our fears, about the things that hold us back and is packed with ways that we can make our brains more elastic and how we can welcome change. This book is packed with quirky illustrations and easy to follow ideas as well as loads of tips and ideas on how to be awesome from winners from all walks of life. 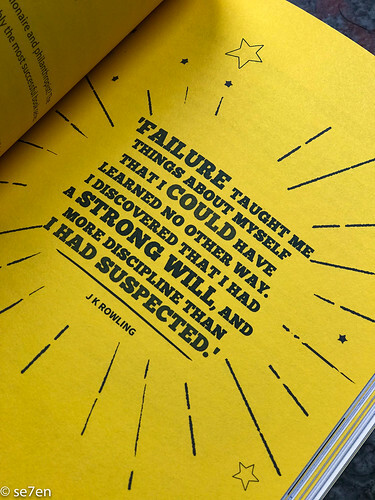 Winners and their failures, and what they did to overcome those failures. This book is very accessible, easy reading snippets that you can dip into and read all the way through, and short enough to read in one sitting if you have to. You can meet the author and table tennis champion, Michael Syed on his website over here. The Teenage Guide to Life Online by Nicola Morgan: Can I just say that if you have teenagers and you and they haven’t read Nicola Morgan’s book “The Teenage Brain,” then stop reading this post right now and get hold of that book and read it… READ IT!!! 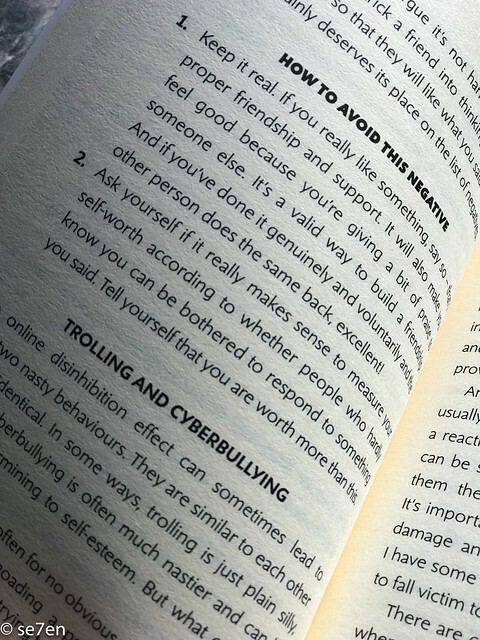 So this book is a book about Life Online and it is the sort of book that you need to read as well as your teens. I know if I told my teens to read it, they would ignore me. Completely. But if I read it, and leave it lying around then they would definitely pick it up and read it… it is a book that you can dip in and out of… it is a book laden with exactly the sort of problems that your teens will be encounter online… describe the problems in detail and give you a list of potential solutions for each of them. This is so useful and so practical… especially for us parents, who may be a little of the pace technologically speaking… we might think we understand the online world, but we don’t… and I think we can safely say that the things that our teens worry about online are oceans away from the things that we worry about… Get this book, leave it lying around… or read a snippet of it to your teens as part of your daily school if you homeschool. It is an excellent, excellent read and a great resource for your kids to go to if they need to glean some information fast. The author, Nicola Morgan has a great website, packed with printable resources and tips. Granny Dangerous and the Dog of Destiny: by Kita Mitchell and Illustrated by Nathan Reed: A fun chapter book, about a mad hat grandma who does everything right in the eyes of her grandson, very much about everything his safety loving mum says he shouldn’t do, and that is not all that grandma is about either. Pure light hearted fun, as Ollie’s adventure loving grandma takes him and a friend to find his dad, who has gone missing in Australia. This is perfect reading for Hood 8, who is ready for chapter books but still finds plenty of illustrations make a book so much more worthwhile. Light and quick and easy reading… a great adventure including a trip across the world, a small and popular dog… and 30 pounds worth of biscuits. This is definitely the kind of granny I would like to be one day… Put this down as a fun loving must read for emerging readers. Meet the author, Kita Mitchell here, and Illustrator, Nathan Reed here. Mirror Magic by Claire Fayers: A magical mystery set in the town of Wyse, the last remaining magical town in Britain… right on the border between England and Wales. Matthew and his younger sister, Ava Harcourt were born in Wyse, and then on the spur of the moment her parents moved to Cambridge, breaking all ties with their magical past. Only they have been struck down by typhoid fever and had to sell their home to pay off their debts. They are forced to return to Wyse to earn a living under their uncle, Lord Skinner. So orphans, hard times, a wicked uncle, a most unwelcoming town… and MAGIC!!! It turns out that there is a lot more to mirrors than meets the eye and when Eva Connects with a green haired boy… Well it is a mystery, bordering between truth and reality, between England and Wales. It is a whimsical read… with one of the favourite characters being “the book,” who writes endless poetry and commentary throughout… a great read for whimsy loving, adventure seeking, chapter book readers. You can meet the author, Claire Fayers, on her website here. And tons of lovely printable resources here. Embassy of the Dead by Will Mabbitt and illustrated by Chris Mould: If your kids like creepy stories then you have found one here… if they don’t, just move on!!! It is a horror story, which would push it slightly into the older age group than my youngsters could cope with. This is the story of Jake, who’s is dealing with his parents separation, well that’s the back story. The main story is hilariously funny and grizzly indeed… it opens with Jake walking through an alley and a very characterful ghost, called Stiffkey, who gives him a box, that he later discovers has a severed finger in it… Yikes!!! It is a case of mistaken identity, Jake should never have received the box and now he finds himself in a desperate panic to escape from those who immediately know that he has opened the box. And I did say creepy… but it is also seriously funny and punny. Jake makes good friends, and this is clearly the beginning of a series to follow. If you have a horror loving youngster then this would be a great story to pick, though I am tagging this book with a proviso, in places it isn’t for the fainthearted. You can meet the author, Will Mabbitt here, and the illustrator, Chris Mould here. Sir Tony Robinson’s Weird World of Wonders: Pets, written with Jessica Cobb and illustrated by Del Thorpe. 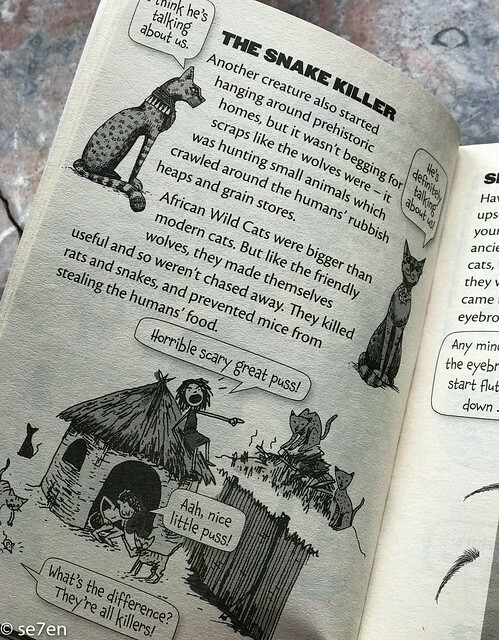 Sir Tony Robinson’s Weird World of Wonders series are great for new readers that prefer non-fiction, especially since all the facts are presented in bite sizes. This book is all about pets, as the title suggests. The where, the why and the how of pet keeping, not to mention some very weird pets. From the bizarre to the ridiculous, how to accessorise your pets and heroic pets… page after page of amazing facts. You can meet Sir Tony Robinson and listen to extracts of his books on his author page here.